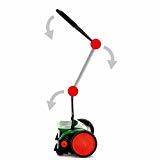 Reel lawn mowers use blades set on a revolving cylinder or reel to cut the grass. These mowers are powered either through human effort or engine power; when the reel mower is moved forward the reel moves cutting the grass. Reel mowers are one of the oldest concepts of lawn mowers and still a fast favorite with many people despite all of the technological advancements we have made. Reel mowers perform a shearing action when the rotating blade comes in contact with the stationary bar that runs parallel (bed knife) to the ground. This bed knife holds up the grass and the reel blades shear off the tops of the grass. The mower is capable of being adjusted to varying cutting heights. Reel mowers give the grass a very close cut and also perform one of the best cutting actions. The grass is neatly cut instead of being torn or ripped out and this type of machine is quite popular on the golf courses. The clippings from the reel mower are of an extremely fine cut and get left behind on the lawn to act as natural fertilizer. For the best cut the blade and bed knife need to be correctly adjusted to work in tandem. If the bed knife is very close to the blades, they will get caught on the bed knife during rotation. On the other hand, if the bed knife is far away from the blades the grass will not get cut properly. Depending upon the model, adjustments are very easy to make – simply turn the screw or bolt to keep thing well aligned. It should be mentioned that the modern reel mowers are a lot easier to use because of the lightweight materials used to make them. Alloys built into the framework makes them a lot more maneuverable. On the downside twigs and other debris tend to get stuck in the blades because they do not have chopping power like the rotary lawn mowers do. Due to this, you need to take a walk around your lawn and clean up debris before mowing. This means an additional task, which is fine if you like the exercise.